It is vital that you respond to the consultation by Tuesday 23 May 2017 – see below. Also, your friends and family members. South Eastern’s franchise expires in December 2018 and therefore the Department of Transport (DfT) is looking to find the next operator. They have initiated a Public Consultation and issued the document “Shaping The Future” which looks at the current service, future challenges and the option for improvement for the South Eastern network. This could threaten the rail services at Paddock Wood, Marden, Staplehurst, Headcorn, and Pluckley. What are the implications for Pluckley station? One of the challenges highlighted in the report is to speed up longer distance journeys and DfT is exploring options for reducing the journey time on the existing mainline route between the Kent coast and Charing Cross via Tonbridge. 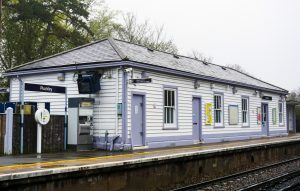 The consultation document explores reducing calls at “less well used” stations while acknowledging the “potential inconvenience” of passengers that use these “intermediate stations”. From the data available, we believe Pluckley station would fall into this category and thereby be a target for cuts in services. We believe this would be disastrous and could potentially lead ultimately to the closure of the station. Please respond to the consultation. It is vital that you respond to the consultation by Tuesday 23 May 2017. The SAVE PLUCKLEY STATION CAMPAIGN wants to hear from you. 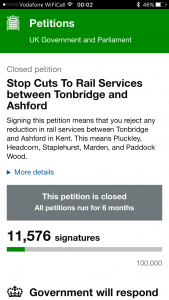 An online petition was started in April but only ran for three weeks due to the General Election. However, in that time an amazing total of 11,576 people signed the petition. We were very pleased to reach the 10,000 target for the Government to respond. Just a note that about 500 people per hour signed the petition in the final few hours.